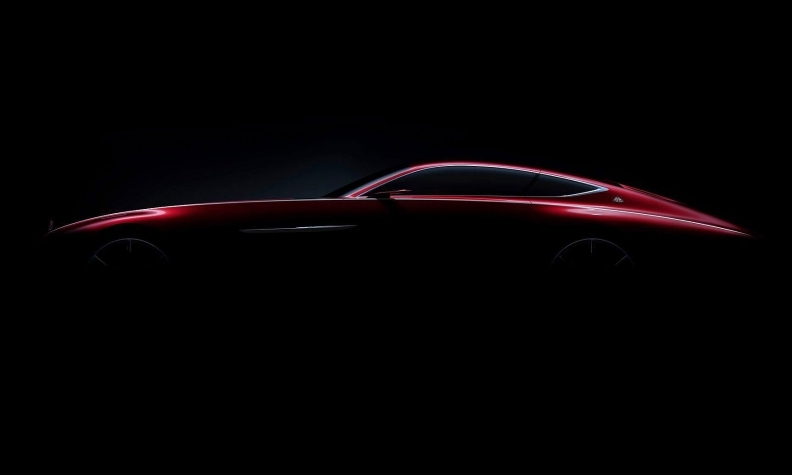 Mercedes teased a sleek red sports car. FRANKFURT -- Mercedes-Benz gave a sneak preview of a new ultraluxury Maybach coupe on Thursday in a sign that parent Daimler is continuing its push upmarket to turn up the heat on BMW, which owns the Rolls-Royce brand. A tweet from the @MercedesBenz account teased a photograph showing the outline of a sleek red sports car with the words: "Hot & Cool - Almost 6 meters of ultimate luxury." The Rolls-Royce Phantom is 6 meters in length. Mercedes declined to say whether it is a Maybach prototype vehicle or destined for production, but a spokesman said it will reveal more at the Pebble Beach Concours D'Elegance, a classic car show held in California, later this month. The car is adorned with a Mercedes-Maybach badge. The concours shows 200 of the most prized cars in the world, attracting the world's top car collectors. Mercedes wants to overtake rival BMW to claim the title of biggest selling luxury carmaker. As a result, Mercedes has been on a product offensive to give its cars a more upmarket appeal, including the revival of the Maybach and Pullman brands. Last year, BMW retained the title of largest premium automaker, posting sales of 1.91 million BMW branded passenger cars while Mercedes sold 1.87 million cars, compared with a 3.6 percent jump to 1.8 million sold by Audi. BMW has held the annual sales crown since 2005, but has already surrendered the top spot this year. In the first seven months, BMW sold 1.13 million of its own brand cars against Mercedes's 1.17 million.